If you're been following my blog for awhile, you know I rarely talk about my children on social media. Simply because I value their privacy more than likes and clicks. As we head into the last few weeks of the year, it's important to reflect on all that we're thankful for and I wanted to share a proud mom moment with you. People always say the teenager years are tough. While it's a true statement, it's been an easy ride for us. My first daughter is 13 and she's the most well-rounded teenager if I have to say so myself. She's a straight-A student as long as I can remember, incredibility mature for her age and has a good head on her shoulders. Raising this kid has been a dream. 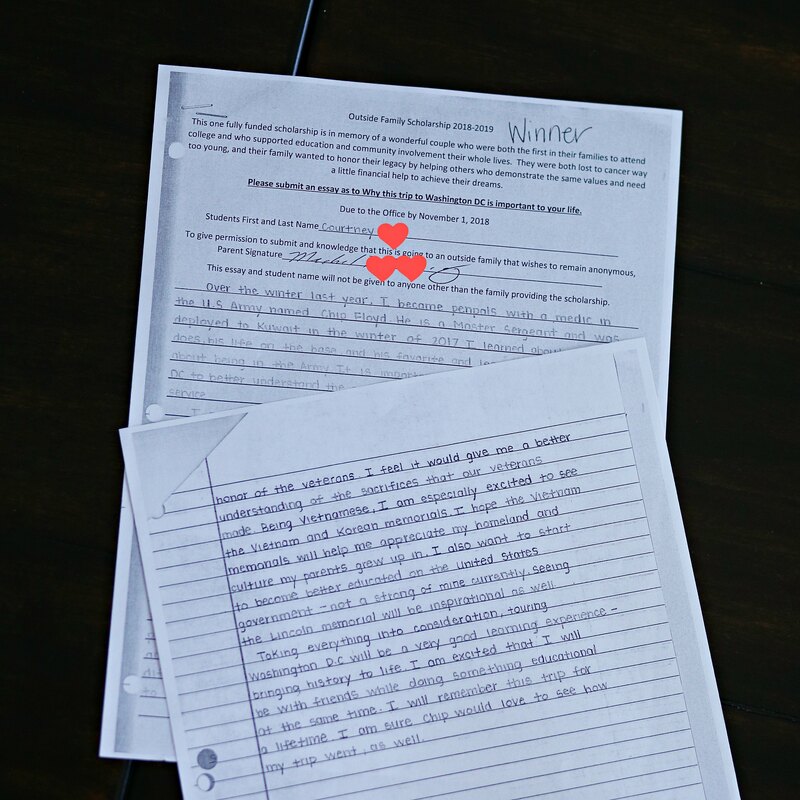 A month ago, she wanted to submit an essay to a writing contest for a chance to win the full scholarship for her upcoming trip to Washington DC. First, can we take a moment to acknowledge how amazing her hand writing is? Out of 100 essays, hers was selected as the winner of the writing contest! When she called and told me the news, I teared up a little. It was one of those moments that you realized you must do something right to raise such a remarkable young lady. I know this is just a beginning. This girl has so much potential and I know she'll do amazing things in life. Wow! That's amazing. Good for her and for you! Aww! Great job on raising her Sydney and congrats to your daughter! Such a big accomplishment!! Thanks, Jen. Love that kid! Congrats Sydney. Give yourself an applause too because I’m sure your support means a lot to the girls too. I am a long time and casual reader. I am not particularly into fashion or luxury purchases (cannot bring myself to spend on them even though we have considerable disposable income) but enjoy the small glimpses you post of your personal life and how your set your priorities. I live vicariously through your purchases :) Your love for your children is apparent and I admire the respect you have for their privacy (and by extension, their well-being) in this world where everything is leveraged for clicks and likes. Your children are lucky to have you as their mum. Congrats to your girl- she is thoughtful and articulate. I wish her a good trip to D.C. Thank you for your kind words. I love being their Mom. They make me feel loved and important. Parenting is hard but when I see the girls put into practice what we've taught them, it is worth it. We won't be able to give them everything but the love will always be there. Happy holidays to you and your loved ones! Congratulations to your daughter! Her penmanship is beautiful.